Green clay named “Har-Tru” is the fastest. It is made of crushed basalt, which greatly increases its speed characteristics. Green clay is widely spread in North America. There is also maroon clay which is similar to the green one and is used only in one event, that is US Mens’ Clay Court Championship in Houston. Most of clay courts in Europe are made of crushed brick that is packed to cover the court. The brick is topped with loose particles that don’t absorb water. The French Open is played on red clay courts composed of the variety of materials. 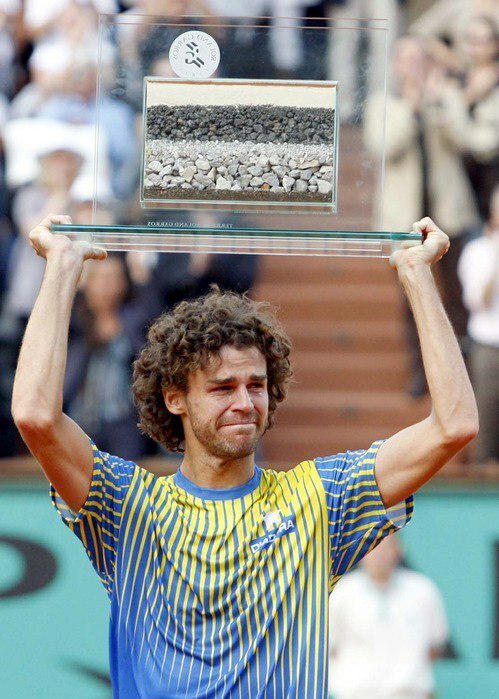 The former World No.1 Gustavo Kuerten from Brazil received a piece of the court from Roland Garros officials. The trophy showed all composition parts of the court. It turned out that beneath the layer of porous limestone is 10 cm of volcanic rock followed by a 0.91 m layer of sand, all of which rests on a slab of concrete and is covered with crushed brick. The serve loses its vital importance on clay. It is mainly attributable to the fact that the velocity of the ball slows down after it collides with the clay. Secondly, the ball bounce gets higher, which provides the receiver with an advantage and gives more chances to hit the ball back to the server. Still the forcing serves (at least 130 mph) keep being dangerous on clay. They are difficult to receive even on the slowest clay. Therefore, the powerful tennis players can achieve very decent results on clay too. As for the return tactics, primarily it should be very aggressive. Unlike the fast courts, where it is vital to hit the ball back to the opposite side of the court, clay court players strive to put pressure to their rivals. That is why it is evidently important to be aggressive on return (especially of the second serve). Roger Federer is an excellent example of the kind. Physical power is probably the most important playing aspect on clay. It is necessary to attack and apply power to the shots. Due to this, players known for their physical strength often rise to the top in long clay matches: Rafael Nadal with his powerful forehand, or Stan Wawrinka with his booming backhand. The retired Swedish player Robin Soderling possessed lethal forehand too. Clay-court specialists use powerful strokes because on slow surface any opponent will have enough time to prepare for hitting back the forehand or backhand. So the only beneficial thing to do is to hit the most forceful shot you can to throw your opponent off. Novak Djokovic started showing good results on clay only after he learnt to deep towards his opponent’s forehand and backhand. Take a look at how the Serb put all his strength when making a shot. It should be noted that the players who play fast play also have chances to be successful on clay. Kei Nishikori, David Ferrer, Roger Federer have no powerful shots in their arsenal but as they are fast to hit the ball back, their opponents have no time to make a tactical decision. It's clear that this tactics is more typical of fast courts but it can also be applied on slow surfaces. Pay attention to the youngster player – Dominic Thiem. He gained most of his clay titles due to his playing style: the Austrian hits powerful groundstrokes and tenacious backhands. He certainly makes errors but the number of winning points on clay prevails over the mistakes number. Footwork is another crucial aspect when playing clay matches. The competitor should be ready for the long-lasting marathon. 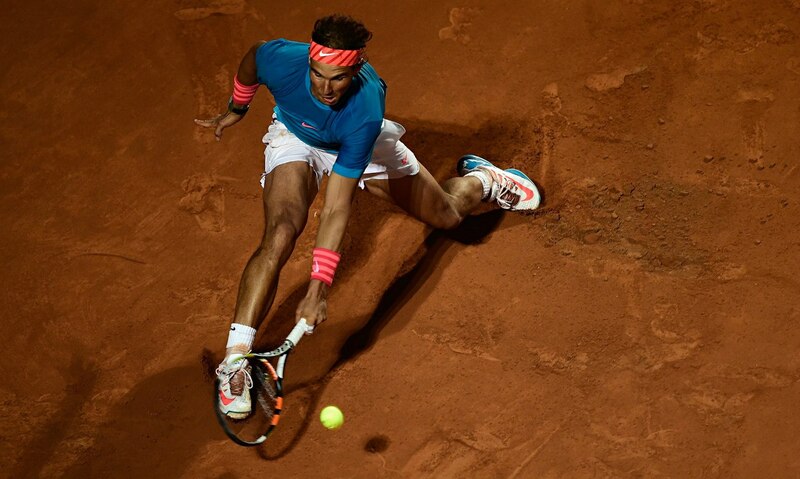 One should possess good endurance to show vivid clay-court performance. Let’s refer at this point to “The King of Clay” Rafael Nadal. The Spaniard is one of the most endurable players of the modern times. Many experts point out his fantastic footwork and court placement. But today there has appeared a constellation of layers with outstanding endurance base: Djokovic, Wawrinka, Murray. The Swiss No.1 Roger Federer states that serve-and-volley strategy doesn’t dominate on clay courts. 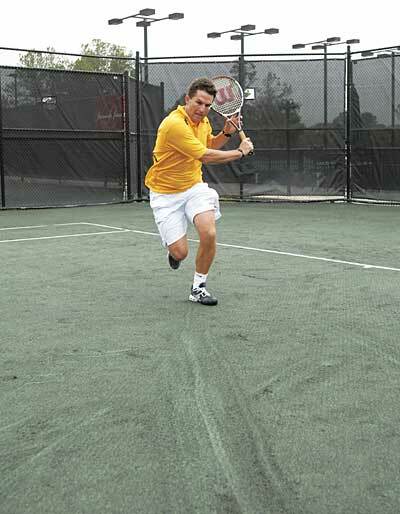 It’s more important to possess decent footwork and hit powerful forehand and backhand shots. Rafa Nadal is of another opinion. The Spaniard believes that it’s vital to see your path to success. On fast courts, the task seems to be simpler as your only weapons are the serve and forehand. As for the clay events, you have to possess more variance and be able to change your game style in the course of the match: take an attacking position and then move to the defensive style, approach the net or stay on the baseline. Any surface is unique and has its own advantages and disadvantages. Solid footwork and dominating forehand and backhand shots will never guarantee the winning outcome. The longtime coach of Gilles Simon, Thierry Tulasne points out that the main factor that makes the clay matches so unique is court placement, or sliding, to be more precise. Special concentration is needed to approach the ball and handle it properly. The French also says that not all athletes are capable of mastering this element. For example, Pete Sampras, one of the greatest players in tennis history, has never learnt to slide properly. At times, he slid too long and wasted precious inches. According to the words of the physical training coach of the French Tennis Federation, the clay-court performance requires constant maintaining of physical force and endurance. Footwork is the main weapon here. But the balance has to be found as there is a slight step between flexible endurable body and poorly built muscles. Taking account of a player's physical condition is particularly important for tennis betting at French Open and other clay tournaments. If a players has closed out the previous match with his last strength, don’t hesitate to select a large negative handicap (-4.5 for the best-of-three-set matches and about -7.5 for the best-of-five-set events). Be careful to place wagers on the definite final score. It’s almost impossible to predict the score on the scoreboard at clay events. Mentally tough players are another group of clay favorites we advise you to back. Pablo Cuevas, Souza, Bautista-Agut, Tommy Robredo are very hard opponents to beat on clay. It goes without saying that luck and star power mean a lot in tennis. But at clay events their influence is much weaker than on fast surfaces. Here the stronger player is likely to prevail after all. At that rate, we suggest that you select the Outright winner betting line not a slight positive handicap (+1.5). By doing this you’ll have the same winning chances but at the higher odds. Large positive handicap (+5.5) is just a handicap on clay. 6:0 or 6:1 is not a rare thing to see at the scoreboard.